any other horse or pony that has white markings and / or eye colour that do not conform to DA's regulations for these characteristics for solid dilute registration. Studbook DA NSD Register: mares & stallions - must have 2 registered parents. Proof must be provided. Must PASS conformation standards. Non-studbook DA NSD Register: mares & stallions - either one or both parents are unknown / unregistered / unproveable. Must PASS conformation standards. These DA NSDs have full showing rights. Carry any one, or combination of, the currently recognised coat pattern genes (Tobiano, Overo, Lp) and express these genes to the extent that their white markings and / or eye colour excludes them from registration as a solid dilute. 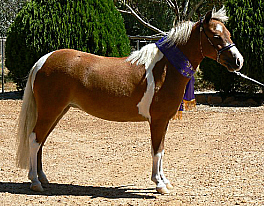 Note - a dilute horse or pony carrying Tobiano or Overo which conforms to the company's regulations with respect to white markings and eye colour is eligible for registration as a solid dilute. 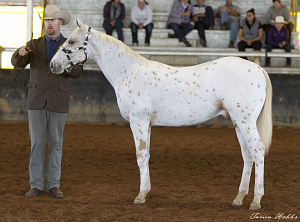 Have white markings and / or eye colour caused by genes other than Tobiano, Overo or Lp which do not conform to the company's regulations with respect to white markings and eye colour. Introduced in May 2008 at the request of owners of broken coloured dilute horses and ponies, the BC & RD Register was originally called the BCD Register. It was a showing only register and carried no breeding rights. In August 2013 dilute roans were added to the register and the name changed to the DA Broken Coloured & Roan Dilute Register. In June 2014 a new studbook register was introduced for dilutes with expressed (ie visible) coat pattern genes and dilutes with genes such as splash and sabino that had expressed as white markings or eye colour that do not conform to DA's regulations for solid dilute registration. The old BC & RD register was discontinued and horses registered in it were transferred either to the new DA NSD register in the case of the non-solid dilutes, upon lodgement of the required paperwork with the Registrar, or to the newly established Section 3 of the Ancillary register for Grey and Roan dilutes in the case of the roans. Our state branches around Australia include classes for the register at their shows. Please note that DA NSDs are NOT permitted to be shown in solid dilute classes ie palomino, buckskin etc. This ruling extends to ONLINE shows. Dilutes Australia recognises all the currently known coat pattern genes, and any combination thereof, for DA NSD registration.